It’s that time of year again folks, Fringe season is well and truly upon us and the events are coming in thick and fast. 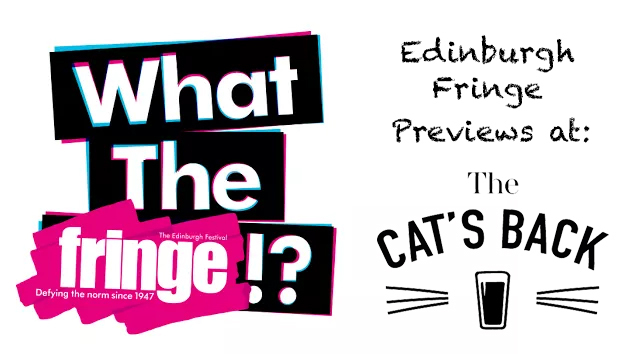 Whilst sadly, we can’t take The Cat’s Back to Edinburgh, we can bring Edinburgh to The Cat’s Back. So with that said, in the run-up to Edinburgh Fringe Festival, this Friday (that’s the 9th of April) we invite you to a night of laughter, debauchery and all round joviality as we bring four of the hottest acts going to preview some brand new material! Just These, Please are “an exciting foursome” (London Theatre 1) presenting new, charming and unusually traditional sketch comedy. They write, edit and perform as an ensemble and, when buying things, always place them on the counter and say “Just These, Please”. Following their full-length show at the VAULT Festival earlier this year, they are making their Edinburgh Fringe debut at the Gilded Balloon in Summer 2018. Click here for their teaser trailer for Hamilton UK, Britain’s answer to the smash-hit American musical. Nick’s captivating and inventive style has marked him out as one to watch. He took his debut solo show to the Underbelly for the 2015 Edinburgh Fringe and also performed in Adam Riches’ Coach Coach at the Pleasance and Soho Theatre. He’s reached the semi-finals of So You Think You’re Funny, beaten the Gong at The Comedy Store, beaten the Blackout at Up the Creek, and won the New Act Night at the Comedy Café. You can watch the highlights of Nick’s show, Spencer, here. Sukh is a comedian and writer who is blazing her way into the Uk Comedy scene. She regularly performs stand up around London and the UK, including performances at the Alchemy Festival and BBC Asian Network’s, sold out show at the Watford Palace Theatre. Follow this link for a short clip of Sukh’s take on the pros and cons of having to move in with your parents. Tickets are £5 on the door and are available on a first-come-first-serve basis. So it’s best to arrive early to avoid being the only one who wasn’t there, and feeling awkward when everyone else comes down into the bar and starts laughing about that part of the sketch you just wouldn’t get because you had to be there. We hope to see Friday! Previous Time Out LOVE LONDON 2018 AWARDS: Vote For Us Now!